Also known as Drywall Screw, a purpose made screw with a concave countersunk head, coarse thread and needle point tips for fixing plasterboard or drywall sheets. Plasterboard or drywall sheets are simple and fast to fix with the right tools. The main one being a specialist screwdriver. The main criteria is to drive the Drywall or Bugle Head Screws Just under the surface and no more. Too much pressure and the surface paper is punctured and the screw will not grip. 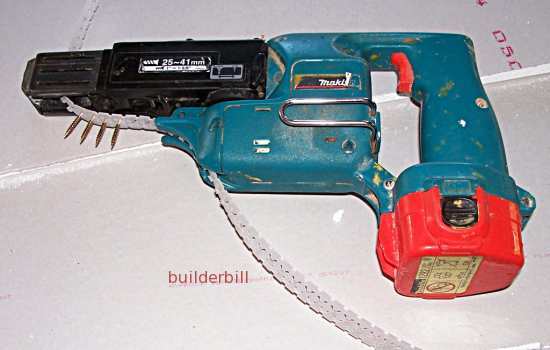 Above is a standard mains power (corded) drywall screwdriver. The collar around the driver tip is finely adjustable so that the screws sit below the surface of the sheets, but does no break the paper. The depth stop triggers an internal cut off clutch to stop the driver. As with all these tools there is a reverse switch. In spite of the fact that they are designed specifically for fixing plasterboard sheets these tools can be used for other screwing work. They have the standard sized 1/4" internal hexagon tool socket and a range of other bits are available to them. They can use the depth stop and screw into softwood or it can be removed and the screw gun can be used for normal work. 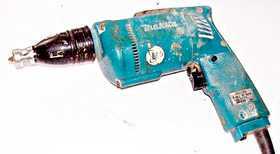 A Cordless Drywall screwgun. Professional plasterboard fixers are on the move and cover a lot of ground in a day's fixing. They like the freedom of having no electrical cord around. This particular version also has another great convenience, having the screws feed in automatically. Typical Bugle Head Screws fix straight to timber and steel ceiling battens. It is said that the screws are to hold the sheets in position until the Stud Glue or adhesive has set. Quick Tip! The screw should never be at the same position as the stud adhesive. Always make sure that they are at least 200mm apart.